The SAXS methodology available at DANNALAB follows the general concepts developed within the beamline communities, particularly at the European Molecular Biology Laboratory (EMBL). Most of the useful information identified by SAXS is related to the higher-order structure, oligomeric state, aggregation pathway and conformational space of flexible systems. An advantage of this method is that it permits the observation of objects that have not been stained or fixed, showing them in their native aqueous environment (in contrast to X-ray crystallography, which generally requires placing the samples in non-physiological environments). The atomic structure of biopolymers in a crystalline state is traditionally determined using monocrystal X-ray diffraction. While this is a powerful and well-established approach, a drawback is the necessity of a crystallization step. This step can be a very challenging task for some pharmaceutically -important substances, such as membrane proteins. The structural properties of a biopolymer in a natural biological environment, such as its higher-order structure, may be investigated using SAXS and often becomes the subject of independent interest. The reason for this is related to the fact that the actual structure of a biopolymer in a solution may differ from its crystalline structure due to its conformational flexibility and tendency to form oligomers or aggregates. 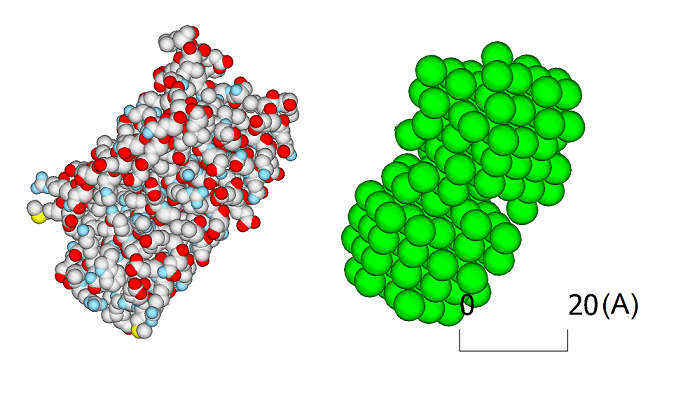 SAXS is recognized as the tool of choice for determining the tertiary and quaternary structure of a biopolymer in a close-to-natural aqueous environment. Alongside solution nuclear magnetic resonance (-NMR) and cryo-microscopy, SAXS is one of the only available methods for visualizing the actual higher-order structure of a biopolymer in its native environment. Example 2. Left - High-resolution HIV GP41 core structure (1AIK entry in the Protein Data Bank) shown in contrast to the SAXS reconstructed structure of trimeric HIV fusion inhibitor, on the right. More examples are available at this link- (TIDES 2012). Together with the envelope structure, useful structural invariants, such as radius of gyration and excluded volume, are also determined. Example 3. 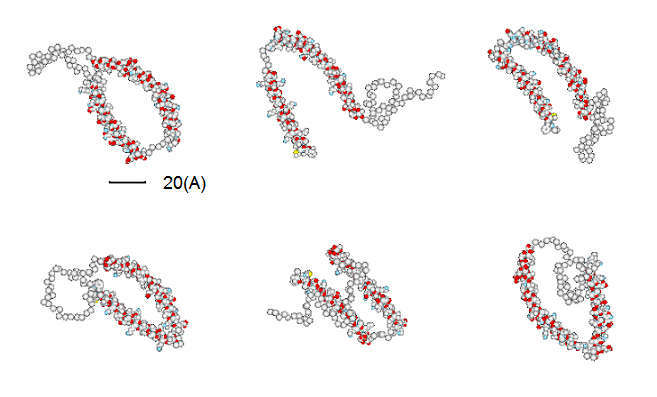 Alpha-synuclein is a naturally unfolded protein with two domains (1-60, 61-95) connected by a flexible linker and third flexible domain (96-140). In the experiment, the coexisting conformers of alpha-synuclein in the presence of different concentrations of sodium dodecyl sulphate (SDS -simulating binding to membrane) were investigated by SAXS. As a result, the selected set of conformers (from a collection of thousands) found to be representative of the observed scattering data. The identified conformers were clustered to select a few different co-existing clusters or "types". The members of one of the clusters are shown above, following 3D rotational alignment. The advent of this "U-shape" cluster within the total ensemble of conformers is suspected to be a precursor to alpha-synuclein neurotoxicity. (DANNALAB B.V. ® 2011). Biological pharmaceutical products are known to be particularly sensitive to environmental factors such as temperature change, oxidation, light and shear. Periodic monitoring of the physico-chemical properties of an intermediate or finished drug substance is required to prove it meets shelf -life specifications. Information about the structural parameters obtained from the SAXS measurements, such as envelope shape and invariants (mass and radius of gyration), serve as important markers that are correlated with biological activity. If changes are identified over time, it is an indication of the potential degradation of the biological drug product. Additional information and test cases are available at SAXSpage.